In the fall of 1947, G. Stanton Selby had just moved to Pomona to take a position on the music faculty of Mt. San Antonio College, then in its second year. An ad in the Pomona Progress Bulletin caught his attention. George Churchill, Commander of the local American Legion Post, was conducting auditions for director of a band to be sponsored by the American Legion. Stan auditioned for the position and became the director of a small group of 17 to 20 musicians who would be known as the Pomona Community Band and later as the Pomona Concert Band, numbering 65 musicians and drawing its membership from many Southland communities. Two of the musicians attending the first rehearsals in 1947 are members of the band today: Alan Carter, trumpet, and Bill Shearer, clarinet. The first years of the band showed a rapid growth with a printed program of 1948 listing 53 musicians. 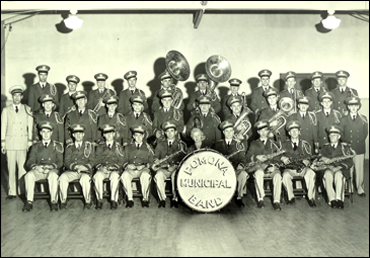 The first uniforms were purchased in 1948 with assistance from the Pomona Department of Recreation and fund raising efforts by the band. Summer band concerts were slated in the summer of 1948 in the old Ganesha Park Bandshell, located between Val Vista and the freeway, with later concerts performed at the Greek Theater. Much of the early growth and popularity of the band can be attributed to the support of the City Council, Pomona Department of Recreation, Pomona Adult School, and extensive coverage of band events by the Pomona Progress Bulletin, then located in Pomona. The efforts of Joe Gendron in publicizing band concerts for all the years that he was managing editor of the newspaper did much to establish the audience which the band has maintained over the years. The mid-winter concerts started in 1949 and, continuing into the '70s, were very popular events. Stan Selby managed to put together crowd pleasing shows that often ran for two consecutive nights. Starting at the old Pomona High School on Holt Avenue and later moving to other venues, this show was staged at the Fox Theater in Pomona, Bridges Auditorium in Claremont, Gardiner Spring Auditorium in Ontario, the Fairplex, Mt. SAC Gymnasium, and the GOSH Pavilion in Claremont which is currently the Candlelight Pavilion. 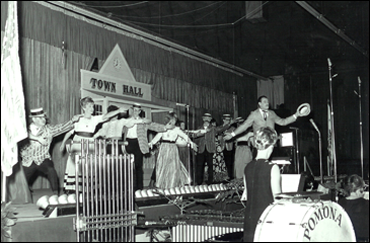 The fact that Pomona had no auditorium for the performance of a large band did not stop Stan Selby from staging extravaganzas to delight his audiences. The first half of the evening was a straight concert band performance with an outstanding guest artist or band soloist. The second half moved to a variety show format with pit orchestra, including strings, an on-stage chorus often in costume, soloists and dancers. Tributes to Victor Herbert, Sigmund Romberg, Rodgers and Hammerstein, Cole Porter, Meredith Wilson were some of the themes used by Selby. Many of the Valley's most talented instrumentalists, singers and dancers joined to make these concerts memorable events. The most popular programs for the band have always been the outdoor summer concerts. The balmy Southern California evenings are a great asset to this type of setting and have established a large audience from Pomona and neighboring cities. 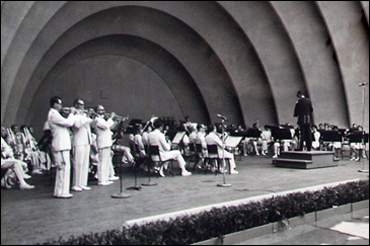 Before the new bandshell was constructed in 1959 at a cost of $70,000, the band performed on a platform just south of the present structure. A nostalgic memory for many is the picturesque popcorn wagon brought every week by George and Sophia Clarke. The bandshell we enjoy today provides a lovely setting for summer programs and affords ample seating. The improvements of the picnic area in 1996 have added greatly to the enjoyment of many who come for supper before the concerts. 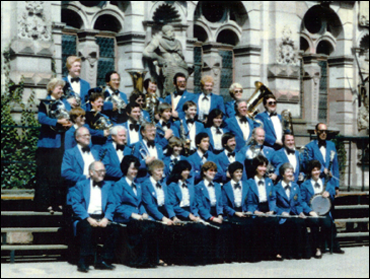 The band has been fortunate in having an opportunity to be ambassadors abroad, first in 1986 with a concert tour to Europe for performances in Salzburg and Heidelburg. In 1988, Japanese friends invited the band to Japan for performances in Tokyo and other major cities. The Pomona Concert Band plays an important part in the life of the city, whether it's for the opening of the Little League series, at Fiesta Days, offering Christmas music at City Hall, or graduation ceremonies at the Western University of Health Sciences (formerly COMP). This year, the band will open the 75th season for the Los Angeles County Fair and perform on opening night in the grandstand at Fairplex. Special indoor concerts at Christmas and in the spring have been an attraction for the past six years, with the band presenting concerts in several of Pomona's churches. The Pomona First Baptist Church was the setting for this year's spring concert. On December 14 of this year, the band will present a Christmas Concert at Pomona First Presbyterian Church. Each member of the band is an integral part of a group which could only survive for fifty years when its members are dedicated and willing to make the band a priority. Stan Selby has provided the kind of leadership that engenders this kind of loyalty through the fifty years of his own personal dedication to the band that he loves.